This year Dolmen Malls celebrated their 24th year of the annual "Dolmen Shopping Festival" which was a series of events across the three malls in Karachi marked the launch of the 17 days of festivities filled with fun contests, exciting discounts, and delicious food. This star-studded evening was kicked off by the surprise arrival of stars Iman Ali, Anoushay Ashraf, Faizan Haqque and the musical sensation Zoe Viccaji. 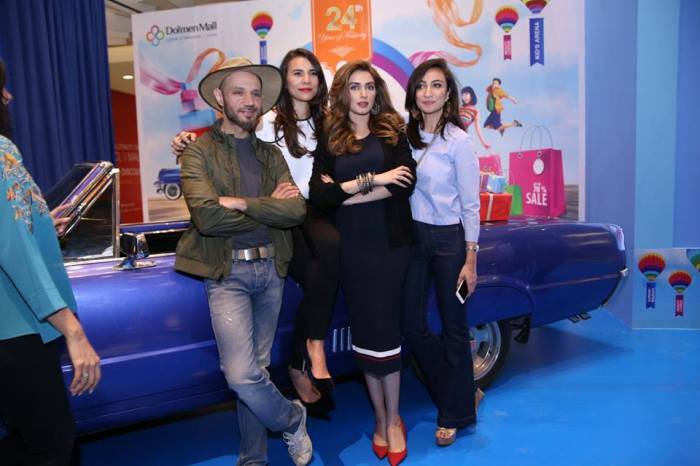 Besides just the launch of the festival, dolmen had offered the shoppers a list of discounts and offerings during the festival. Not just that, but Match & Win game, Magical Doors, lucky draws and fun activities for the whole family was existed to get everyone engaged throughout. Dolmen Mall started the lucky draw, throughout, which will have daily winners as well as a grand prize of 1 Million Rupees at Dolmen Mall Clifton, powered by Summit Bank. The prizes for Dolmen Mall Tariq Road and Hyderi are 500,000 PKR and 250,000 PKR respectively. Not just that, shoppers can also win gifts from Dolmen Mall brands through five lucky draws every day. Discounts by various brands was the major attraction for the shoppers to visit dolmen and to avail them. But not only that, you can enter the lucky draw to win 1 Million Grand prize if you shop more than 10,000 PKR. Sunday Brunch was introduced as an added treat at the festival for the shoppers from 11am till 1pm straight. Adding up to it was the live classical music performance. Careem, now you don't have to worry about picks and drops because Careem got that covered for you. A straight 20% off on all rides was given to all the shoppers who wants to go to Dolmen or from Dolmen. Join in the conversation on twitter, facebook or instagram!